You are currently browsing the category archive for the ‘Two-color Films’ category. ‘Baby Checkers’ is the last of three surviving Gran’ Pop Monkey cartoons, a cut series made in the last days of the Ub Iwerks studio. The cartoon copies the story of the first, ‘Beauty Shoppe‘, in that Gran’ Pop Monkey and his two grandsons try a new business. This time they try their luck with a baby nursery. The first day is highly successful, with countless mothers bringing in their babies. Unfortunately, Gran’ Pop Monkey’s system to remember which baby is whose, soon runs haywire, and causes much discomfort among the mothers at the end of the cartoon. In between all kinds of things go wrong, like feeding and bathing the baby animals. Nowhere ‘Baby Checkers’ gets near being funny, even if the short makes more sense than ‘A Busy Day‘. The action remains tiresome, the story is disjointed, and the grand finale anything but that. The terrible voice acting and erratic designs don’t help either, and like in the other two Gran’ Pop Monkey cartoons, only the musical score is of a high quality. This, of course, wasn’t enough, and although the reasons are unknown, the series was justly abandoned. ‘A Busy Day’ is the second of three surviving Gran’ Pop Monkey cartoons, and arguably the worst of the trio. The short starts excellently enough, with a rhythmical start of the day, with sound effects, music and images being in perfect harmony to evoke a bright and promising morning. However, this sequence is discarded all too soon, when we cut to Gran’ Pop Monkey, who’s still in bed. His two grandsons awake him, and we watch the trio on a working day in their office on a high tree in the jungle. This setting itself strains the believability of the cartoon, but worse, from that point on, things just start happening on the screen. Somehow, they involve some sneezing by Gran’ Pop Monkey, but otherwise nothing makes sense. In the end of the cartoon an exhausted Gran’ Pop Monkey ends up in bed again, and we, as an audience, are glad that this endless cartoon is over, even if it’s only seven minutes long. The Gran’ Pop Monkey cartoon were made during the aftermath of the Ub Iwerks studio (then called Cartoon Films, LTD), just before Iwerks sold the studio and went back to Disney himself. The character Gran’ Pop Monkey was based on illustrations by British artist Lawson Wood (1878-1957), and in 1939 the studio announced it would make 24 cartoons with the character. However, only three are known today, which were all three released in 1940. In fact, as Yowp notices in his comment to Steve Stanchfield’s informative blog post on this cartoon, these three had already been finished by the end of 1938, so perhaps these were the only ones ever made. In any case, it remains unclear why the series was discontinued, but one thing is certain: they are far from classics. All three Gran’ Pop Monkey cartoons were shot in Cinecolor, a 2-color system, lacking the vibrant color range of Technicolor, and although the animation is fair, the stories, the designs, voices and gags are not, and the three films make a tiresome watch. In fact, the most enjoyable part of these three cartoons is their excellent musical score. The first, ‘Beauty Shoppe’ is arguably the best of the surviving trio. In this short Gran’ Pop Monkey is a barber, helped by his two grandsons (who look like macaques, while Gran’ Pop Monkey clearly is a chimpanzee). Business isn’t going well, however, in contrast to that of the beauty salon across the street (the film takes place in a jungle, but anyway). So, one of the grandson suggests to copy the salon’s formula. Soon, female animals rush into Gran’ Pop Monkey’s cabin-turned-beauty salon (including a colorful company of a badger, a penguin, a seal, a pig and a kangaroo). When a gangster-like gorilla demands they make his wife, a hippo, beautiful, things turn very bad for the trio, indeed. Curiously, ‘Beauty Shoppe’ starts with some dialogue in rhyme, which is discarded halfway. In January 1930 Pat Powers, Walt Disney’s distributor, hired away Disney’s star animator, Ub Iwerks, the man who had created Mickey Mouse. Iwerks was to set up his own studio, with animators quickly hired with help of a newspaper ad. ‘Fiddlesticks’ was his pilot film, launching Iwerks’s own new star, Flip the Frog. According to David Gerstein in ‘Animation Art’ the origin of Flip can be found in the Silly Symphony, ‘Night’, which features a dancing frog. Apparently, Iwerks wanted to make a star out of this frog, but this idea was vetoed by Walt Disney. Now, with his own studio, he could launch Flip the Frog as his sole new star, which the likable if bland amphibian remained until 1933. Surprisingly enough, ‘Fiddlesticks’, was made in Technicolor, making it the first sound cartoon in color, predating Walt Disney’s first color cartoon, ‘Flowers and Trees‘, by two years. A milestone, one would say, if Walter Lantz had not already made a Technicolor cartoon sequence for the feature ‘The King of Jazz’, released in April. Moreover, in 1930 Technicolor was still a two-color system, only showing greens and reds, and Iwerks fails to do anything with the colors, which are less impressive than the later full color technicolor, anyway. Indeed, the following Flip the Frog cartoons were all in black-and-white. Not only does ‘Fiddlesticks’ fail as a color cartoon, it is also disappointingly boring. The animation is good, and there’s a lot of rhythmical movement, perfectly synchronized to the soundtrack, but the cartoon is devoid of any story, and low on gags. The main body of the cartoon features a concert performance with Flip dancing and playing the piano, while a rather Mickey Mouse-like mouse plays the violin. The duet reuses some gags from earlier Mickey Mouse cartoons, like ‘The Jazz Fool‘ (1929) and ‘Just Mickey‘ (1930). Unfortunately, ‘Fiddlesticks’ shows the problems of many Flip the Frog cartoons to follow: the animation is fine and the atmosphere is joyful, but the cartoons are surprisingly low on gags and the stories never really come off, mainly due to sloppy timing and the absence of a build-up. 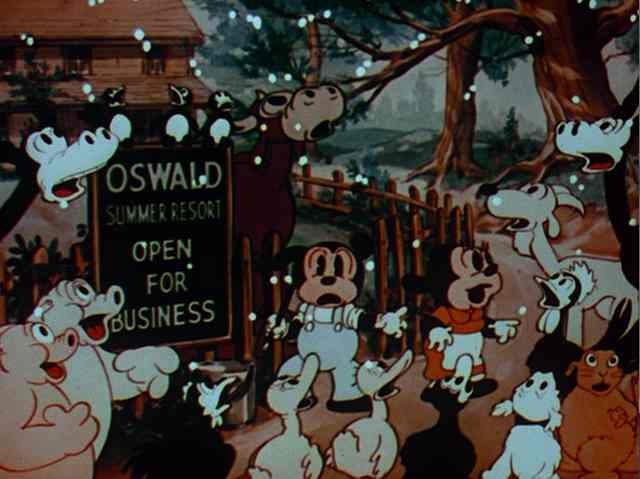 ‘Springtime Serenade’ features Oswald and his unnamed girlfriend among some cute furry animals. They all believe spring has come, even though the old groundhog warns them for six more weeks of cold weather. After some joyous spring cleaning (what the &$#?!! ), the groundhog turns out to be right after all. This Cartune Classic is as cloying as it is unfunny. Tex Avery, who was an animator at Lantz’s at the time, would deal with cute furry animals such as these ten years later in ‘The Screwy Truant’ (1945). ‘Jolly Little Elves’ is the first of six Cartune Classics, Walter Lantz’s answer to Disney’s Silly Symphonies. These six cartoons were made in two color technicolor, using red and blue, and all are possible even more cloying than contemporary Silly Symphonies themselves. ‘Jolly Little Elves’, for example, is a practically humorless fairy-tale in song about a poor shoemaker and his wife who help a little elf and get all their shoes repaired by hundreds of elves in return. The cartoon is corny, overlong and features an irritating song about dunking donuts in coffee. Also featured are two severely caricatured Jewish elves. It’s a wonder that was one of the three Academy Award nominations for 1934. Luckily it lost to Disney’s by all means superior cartoon ‘The Tortoise and the Hare’. 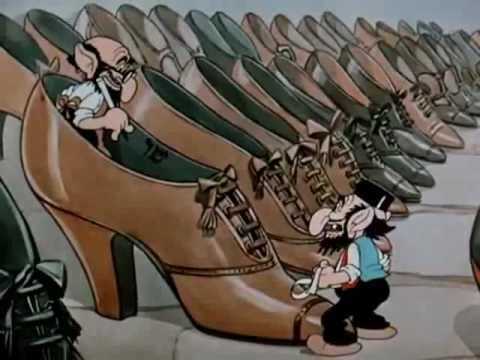 Sixteen years later, Tex Avery, who was an animator at Lantz at the time, would remake and make fun of ‘Jolly Little Elves’ in ‘The Peachy Cobbler’ (1950). ‘Poor Cinderella’ is the first of Fleischer’s Color Classics series, a series meant to compete with Walt Disney’s ‘Silly Symphonies’. It features Fleischer’s proven star Betty Boop in her only appearance in color, and it’s undoubtedly her most elaborate cartoon. Although filmed in the two-color technique of Cinecolor, which only uses reds and blues, its designs are lush and colorful. Nevertheless, ‘Poor Cinderella’ remained the only Color Classic in Cinecolor. The seven subsequent entries were filmed in 2-color Technicolor, using reds and greens, until Disney’s monopoly of 3-color Technicolor expired in 1936. The first full color Color Classic was ‘Somewhere in Dreamland‘ from January that year. Apart from color, ‘Poor Cinderella’ boasts some stunning backgrounds, using Fleischer’s unique 3D-technique for the first time. In this technique 3D sets are used as a background to the animated cells to mesmerizing effects. Until the invention of the multiplane camera, which made his debut in ‘The Old Mill‘ in 1937, Fleischer’s 3D technique remained unchallenged in its wonderful creation of depth. The story is quite faithful to the original fairy tale, albeit with some typical Fleischer touches. For instance, when the Fairy Godmother gets Betty into a wonderful outfit, the latter is seen in her underwear, something that would never happen to Disney’s Cinderella. Oddly, Betty is red-haired and blue-eyed in this cartoon; probably to make her fit in better with the designs of those same colors. The changes between the scenes are creative and original. The Fairy Godmother is closer to human design than anything in previous Fleischer cartoons. The horses are drawn very realistically, as well, surpassing comparable designs at the Disney studio, although they do not move correctly. ‘Poor Cinderella’ was clearly made with the intention to compete with Disney, and remarkably, it does challenge that studio. Nevertheless, the Fleischer studio had difficulties to be on par with the ever advancing Disney studio, which pushed the limits of animation in almost every Silly Symphony it released, leaving the promise of ‘Poor Cinderella’ unfulfilled.